Emergency first aid at work level 2 (EFAW) is a one-day course that covers the basics of first aid treatment in an emergency situation, such as an incident or accident in the workplace, or the sudden illness of a colleague or customer. The course is taught by experienced, qualified trainers, and can be delivered either on site at your place of work, or as an open course at a local training venue. The emergency first aid at work level 2 course leads to a nationally recognised qualification that is valid for three years, even if you change employer. This course is designed for appointed first aiders in low risk workplaces, such as offices and retail establishments where there are small numbers of staff, typically between 25 and 50 workers. Low risk environments with more than 50 workers should consider the 3-day First Aid at Work course. The emergency first aid at work level 2 course will giveyouthe knowledge and skills you need to deal appropriately with casualties, reducing the impact of injuries and illnesses, and potentially saving lives. The course is also designed to enable employers to meet their first aid obligations under current health and safety law, and to create a safe place of work for employees. Under Health and Safety (First-Aid) Regulations 1981, employers are obliged to provide sufficient equipment and suitably qualified personnel to ensure that anyone injured or falling ill at work can receive the attention they need in a prompt and appropriate manner. The law applies to all workplaces, including those with five or fewer workers, as well as to the self-employed. There are no hard and fast rules on the levels of appropriate first aid personnel, and to work out the number of first aiders you will need, you must do a first aid needs assessment. It is important to accurately assess your first aid requirements and make provision as appropriate, as the Health and Safety Executive will prosecute companies who disregard established standards, fail to comply with the law or who put their employees at significant risk due to lack of first aid provision. Of course, providing appropriate first aid cover is more than just a legal obligation. If there is an accident at your workplace, and you do not have suitably trained and qualified first aiders available to provide appropriate care and treatment, then there is a risk that serious injuries and illnesses could result in the death or permanent disablement of the person or persons involved. As well as complying with health and safety law, you also have a duty of care to provide a safe workplace for your employees and visitors. While health and safety law does not oblige you to consider customers or visitors to your premises as part of your first aid needs assessment, the Health and Safety Executive strongly recommends that you include them and make appropriate provisions. Examples of low risk workplaces include retail, offices, schools, universities, churches, care homes, warehouses, bars, beauty salons and community groups (although some areas of schools/universities, such as science labs and wood/metal workshops may fall into the high risk category due to the presence of chemicals of machinery). High risk environments include construction sites, restaurants, factories, agriculture, the motor trade, laboratories, gyms, industrial cleaning and the transport sector. In certain circumstances, you may not need nominated and trained first aiders. Small companies with low risks and under 25 workers may only need an appointed person to take charge of first aid arrangements. Their duties will be to maintain the first aid kit and to call the emergency services in the event of an accident or injury. Appointed persons do not require first aid training. However, it is important to understand that an appointed person is the bare minimum of provision for first aid, and that even if anominated and trained first aider is not required by law, it may still be prudent to provide this level of cover for your staff and customers. A nominated first aider is someone who has been trained to at least the minimum standard in first aid. They must have passed this course – emergency first aid at work level 2 (EFAW) – or the longer 3-day first aid at work level 3 (FAW) course. Your first aid needs assessment will inform you as to what training your nominated first aiders require. The 3-day first aid at work course covers the same basic syllabus as the emergency first aid at work level 2, but also covers first aid procedures for a range of specific illnesses and injuries. Please note that these are minimum numbers and extra first aiders may be required to meet the specific workplace circumstances outlined in your first aid needs assessment. Very small companies or individuals, who share a workspace with others, may find it convenient to share first aid provision, however it is important to create a formal written agreement covering such arrangements. There are no pre-requisites for attending an emergency first aid at work level 2 course. The course is open to all employees over the age of 16 who are physically able to perform the required and assessed tasks, including resuscitation. Special provisions can be made for delegates with certain physical disabilities or learning difficulties, to enable them to play an active role in first aid provision. Please discuss your needs with our training team who will advise on whether this is possible, and if it is, create a bespoke training plan to accommodate the specific needs of these candidates. 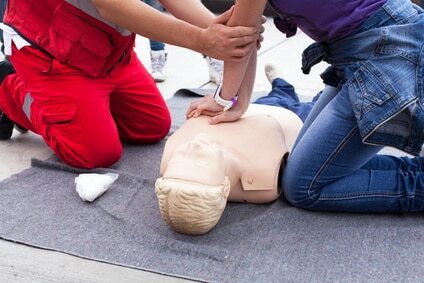 The emergency first aid at work level 2 course comprises 6 hours of guided learning, usually delivered in a single day. Open courses generally run from 9am to 4.15pm, however in-house training can be delivered at different times to suit your shift patterns or peak work periods. The emergency first aid at work level 2 course is a one day course that will teach you all the skills, knowledge and techniques you need to offer essential emergency medical treatment. You will learn how to manage illnesses and injuries effectively until the paramedics, or other medical professionals, arrive. Treatment of external bleeding for a casualty in shock. Since you are no longer able to select Health and Safety Executive approved first aid training, it is your duty as an employer, to choose an appropriate training provider. This will involve due diligence to ensure that the training provider is of an appropriate standard, has the right qualifications and experience,and teaches an appropriate syllabus.All of our training team are fully qualified to deliver the emergency first aid at work level 2 course, and all have the added benefit of many years experience in the training field, helping companies large and small to meet their legal obligations and train their staff appropriately. You should ensure that your training provider holds a first aid qualification themselves, preferably to first aid at work level 3 standard, or is an appropriately trained medical professional, such as a doctor, nurse or paramedic. They should also hold appropriate training and assessment qualifications. First aid training courses and first aid training providers were originally approved by the Health and Safety Executive, however, this has not been the case since October 2013. The only HSE approved first aid courses remaining are those for the offshore industry, such as commercial diving. Open courses will follow a set syllabus and deliver general emergency first aid at work training appropriate to the vast majority of workplaces. All training venues must be fully equipped with a range of practical teaching aids, including sufficient resuscitation mannequins for the number of candidates, with a minimum ratio of one mannequin per four delegates. There should also be procedures in place to ensure these mannequins can be used safely and hygienically by all candidates. While most clients require only certified training, Ofqual approved training foremergency first aid at work level 2 course is also available on request. Please let us know, when booking your course, which level of qualification you require. Both types of emergency first aid at work level 2 courses cover the same syllabus, and both will provide your staff with the knowledge and skills they need to operate effectively as a nominated first aider. However accredited training is regulated in England by the Government-backed Ofqual and provides the extra level of reassurance required by some organisations. Training in Wales is regulated by the Department for Education and Skills (DfES). Familiar surroundings – we find that candidates are more relaxed and learn better in their own workplaceRequalificationAfter three years, you must attend the full course once again to become recertified. There is no ‘top-up’ option for previous certificate holders. We are confident that we can offer you a competitive price for convenient, tailored first aid training. Talk to our friendly team today on 0808 164 9690 and see how we can help you take better care of your team. Emergency first aid at work level 2 is ideal first aid training for small, low risk businesses such as offices and shops. The course leads to a nationally recognised qualification, helps employers to meet their statutory obligations, and in practice can even save lives. However, while the certificate is valid for three years, the Health and Safety Executive advise that first aid skills should be refreshed and updated annually. Ask about our cost effective range of annual first aid refresher courses. Candidates who pass the emergency first aid at work level 2 course will receive a nationally recognised certificate that is valid for three years. This certificate is transferrable if you move employers during this time.